This SLR camera case with built in weather cover has been specifically designed for most makes and models of SLR cameras, and has some neat features to make using your camera easier and more practical, as well as offering the protection required. When using your camera you will be dependent on a range of accessories such as spare memory cards, lens caps, etc. which need to be housed securely, with some needing to be more accessible than others. 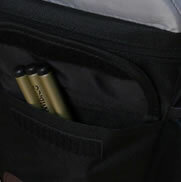 We have therefore designed this case with a range of pockets to suit each of these needs. 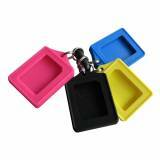 To house secure items there is a neat zipped accessory pouch built into the lid of the case. With this pouch being covered in a soft material, it also separates and protects your camera from further accessories that can be stored in the netted pockets in the lid of the case. 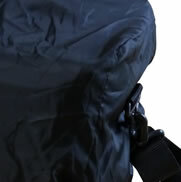 Some items might need to be accessed regularly and more quickly, we have therefore provided a small quick access zipped front pocket, in addition to another front pocket secured with a Velcro fastener as well as two netted side pockets. The weather cover is also easily accessible being accessed from the bottom of the case, stored in a special rear pocket and attached to the bag using a Velcro tab so it is not easily lost. To secure your camera in place, two cradles are provided to sit either side of your lens so your camera is literally cradled to reduce the risk of any damage if the case was dropped. Using this system the lens is not in contact with the base of the case, which is more favourable in the event of the case being dropped. For ease of transportation this SLR case is also supplied with an adjustable non-slip shoulder strap and has a belt loop at the rear. In summary this sleekly designed case made from a high quality tough fabric, with excellent padding to protect your camera against those scrapes and drops that inevitably happen, is the perfect for today's SLR camera. Dr Sanjar June 15 I bought this bag to house a Nikon D750 with a 24-120 Nikon lens and it fits perfectly. I really like the suede type trims' feel and the quality of finish is very good. The suspension support is unlikely to do anything useful in practice as the velcro is attached to material covering the inside surface of the bag and there is not sufficient rubustness. The twin belt loop is very useful as the bag is just not-too-big to go on ones belt although the weight might be a limiting factor. The rain cover is a nice touch. I would say if the manufacturer added another 10mm-15mm of high density padding to the base of this bag then it would be likely to protect the bag content from being damaged seriously if it were dropped from chest/waist height. As it presently is made I would be worried if it dropped that far. 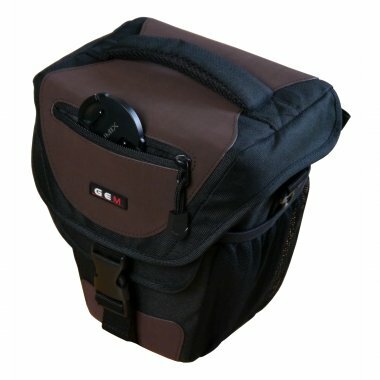 At this price it offer a great bag for protecting your camera from everyday scrapes and bumps in style. Also high praise for GEM delivery service via the Royal mail - reached me day after ordering. Excellent. Jove July 17 Good product.better to use because the clip on the front is easier to open to remove camera than other camera bags that zip the wrong way! Tim Forrester July 14 I wanted a small well-padded bag to protect my Canon 450D and wide angle lens when Im hiking and this is almost ideal. Lots of little pockets inside and out, and adjustable velcro padding. The only downside is its not showerproof, but I dont regret my purchase. Note from GEM Product Support: We have contacted our customer informing them that there is a rain cover concealed in the back of the case. We did try to make the storage area for the cover as discrete as possible.